Barrett Industries Commercial Real Estate Division, Inc.
Barrett Industries Commercial Real Estate Division, Inc. is a highly experienced commercial real estate resource that businesses in Northern Virginia have utilized since 1994. We represent a diverse group of companies that seek local and regional opportunities for the acquisition and leasing of office, warehouse, distribution and flex type properties. Barrett Industries consistently sets a higher standard for conducting a very comprehensive service that provides long-lasting value to our clients and cost-savings to their bottom line. We simplify the real estate process so clients can remain focused on their business. We remain on-call throughout the lease term or ownership period to handle any challenges impacting their real estate. The service is unique, intensely thorough, aggressive and absolutely committed to our client's best interests. And the surprising part - our services are provided to you at no cost except a commitment of trust and loyalty. 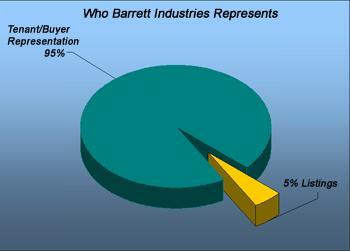 ©2009 Barrett Industries Commercial Real Estate Division, Inc.